Removing tile or wood flooring is an important step in renovating a residential home or business. The traditional method of floor removal is a lengthy process that creates dust and residue that can be hazardous and inconvenient. Normally, floor removal requires the home or business owner to vacate their space for days at a time while the process is completed. Every surface must be covered in plastic, and clean-up can take months as clients find more dust settled around the property from the floor removal process. In fact, for every square foot of tile removed, a pound of dust is created. Fortunately, DustBusters uses floor removal tools and a process that eliminates the dust from the process before it is ever released into the air in your home or business. Our process allows clients to remain in their home, keep their business running, and eliminate the health hazard that dust can create when it’s released into the air throughout our environment. Every project begins with a consultation. After assessing your floor, we provide a competitive and honest estimate for your specific needs. Our team has experience in removing various sorts of flooring, including tile and stone flooring. Property Protection: Even though our process eliminates dust output, we still take care to protect your furniture and other property from any damage during the removal process. All surfaces, including furniture, will be covered with plastic in order to protect it during the project. 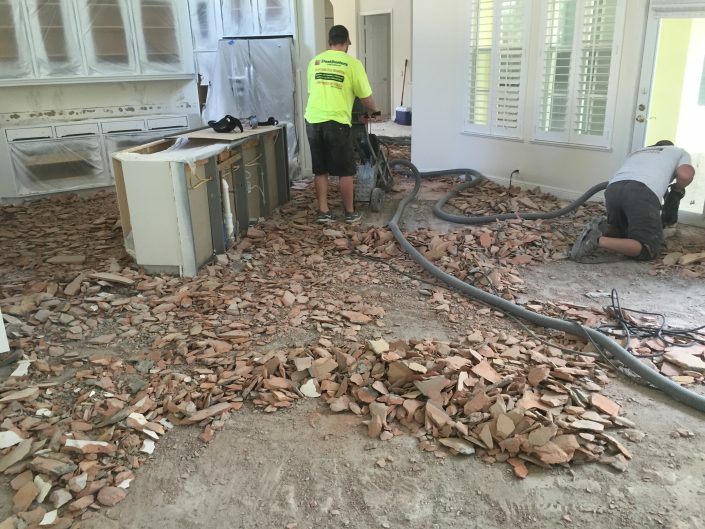 Floor Removal: When removing any flooring surface, our team uses industrial-grade equipment and floor removal tools like jackhammers and scrapers to pull the flooring off of the base. Our vacuum system is connected to our equipment, so all dust is immediately trapped and eliminated at the point of removal. This prevents it from getting into the air or any of the surfaces in your home our business. Grinding the Thin-Set and Finishing: Once the flooring is removed, our team of professionals uses grinders to remove the thin-set beneath the flooring surface and to create an even, smooth slab upon which new flooring can be installed. 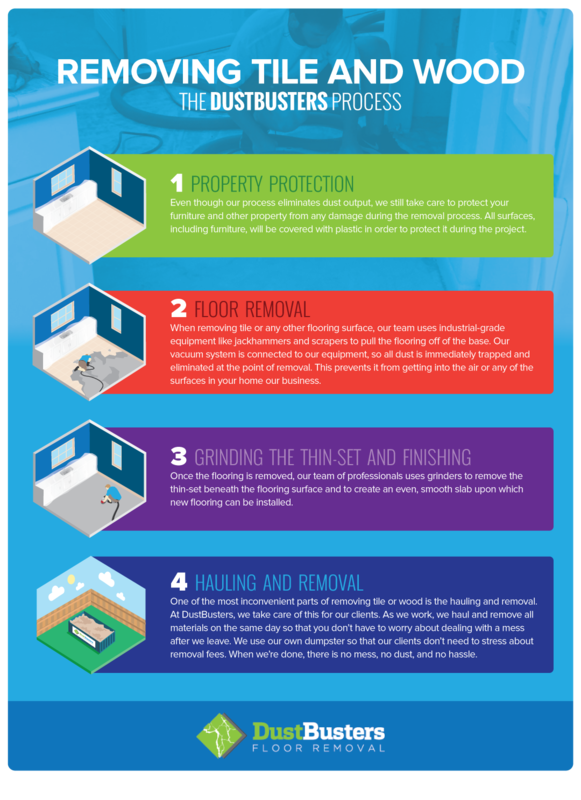 Again, our floor removal tools and process help to make your home renovations dust-free and safe. Hauling and Removal: One of the most inconvenient parts of floor removal is the hauling and removal. At DustBusters, we take care of this for our clients. As we work, we haul and remove all materials on the same day so that you don’t have to worry about dealing with a mess after we leave. We use our own dumpster so that our clients don’t need to stress about removal fees. When we’re done, there is no mess, no dust, and no hassle. Our process for floor removal tools make the process efficient, safe, and transfers savings to our clients. With less prep time required and no clean-up to worry about, your project will be done quickly and professionally. DustBusters uses vacuum technology and quality customer service to ensure that you have a clean, smooth foundation for the next portion of your renovation, helping to ensure the highest quality floor installation possible.